I’ve said it countless times: it’s not a question of if you will lose data, but when. Media, such as hard drives, eventually fails. Or you can make the kind of mistake that results in deleted folders or erased disks. And files can simply get corrupted. There are two things you need to do to ensure you don’t lose data: back up your files regularly, and use software to diagnose and correct problems before they become serious. Since 1998, Alsoft’s DiskWarrior has been the go-to tool for fixing disk corruption on Macs. It’s been eight years since the last update to DiskWarrior. At the time, I reviewed DiskWarrior 4 and gave it the highest rating, five mice. It has saved my data, and fixed hard drive issues, many times over the years. DiskWarrior does one thing, and does it well: it optimizes and repairs disk directories, which contain the information that tells your Mac where files are stored on the disks attached to it. If directories become corrupted, you can lose files. While your data may still be on a disk, the Mac is no longer capable of finding it. DiskWarrior works both as preventive medicine—to fix errors before they become serious—and to correct more serious errors and help recover files when things get really bad. DiskWarrior 5 is a major update to this essential app and includes a number of new features. The most visible is that it no longer comes on a CD. You now get a bootable flash drive that contains the software. To optimize or repair a startup volume, you boot from the flash drive. To work on any other connected disk, you can copy the software to your Mac and run it from there. When you boot from the updated flash drive, which replicates your Recovery partition, DiskWarrior appears in the OS X Utilities window. Click it to launch it, and then select a disk to analyze, optimize, and repair. DiskWarrior shows up in the OS X Utilities window when you boot from a flash drive. DiskWarrior displays a Directory Optimization Index for each drive. Green is good, meaning that the directory is not fragmented. If it’s yellow, this suggests that the directory is “not efficient.” This is a good time to run DiskWarrior to prevent problems from arising. When it’s red, you really need to run DiskWarrior, both to make the directory more efficient, and to fix problems that can become serious. DiskWarrior optimizing an external hard drive. 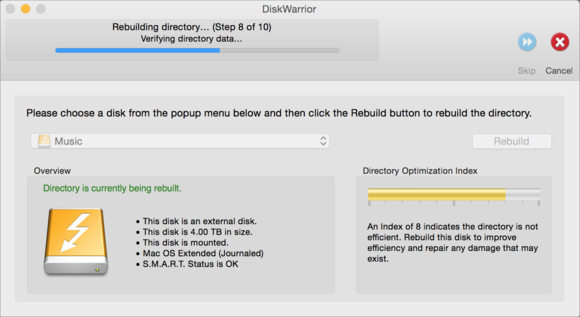 For serious issues, select a disk in DiskWarrior, press the Option key, and the Rebuild button becomes Rebuild…. Click this, and then check Scavenge to have DiskWarrior recover files. DiskWarrior can also check files for damage and check drives for their SMART status, even automatically in the background, alerting you to any problems. And it will work with FileVault encrypted drives; click Unlock on the DiskWarrior window and enter your FileVault password so DiskWarrior can read the disk. I found DiskWarrior 5 to be a bit more finicky than previous versions. There was one disk that it wasn’t able to repair, at first. I launched Apple’s Disk Utility, using its repair function and it found nothing wrong. I then tried with DiskWarrior again, and it was able to fix the directory problems. The speed with which DiskWarrior works depends on the type and size of your drive. It took DiskWarrior just five minutes to run through my retina iMac’s SSD. When I optimized the directory of my Time Machine drive, however, it took more than an hour, and used about 10GB of RAM. (This is not unusual. The way Time Machine works, any such drive has gazillions of files.) But DiskWarrior 4 was often unable to repair Time Machine drives at all because of the large number of files. Since DiskWarrior 5 uses 64-bit memory addressing, it can now handle such large directories. DiskWarrior remains the essential tool for maintaining and repairing disk problems. For both preventive maintenance and repair it’s a must-have tool. DiskWarrior 5 goes 64-bit and adds new (and welcome) features. If you have a Mac that can misbehave (and you do), you should also have DiskWarrior.